These guys did a great job! I had a knocking sound coming from my engine, so I called around to get a quote. I was given a quote and told that there could be additional work that needed to be done. They explained the contract very clearly before I signed. Very impressed. Definitely coming back if I need more work done! Before you replace your engine, be sure to ask us about our special Internet discount. 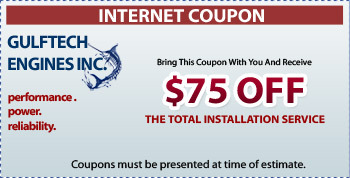 We can currently offer $75 off the cost of any engine installation. This is just one of the many ways in which we strive to provide the best price for engines and customer-focused service. How reliable are Gulftech Rebuilt engines?